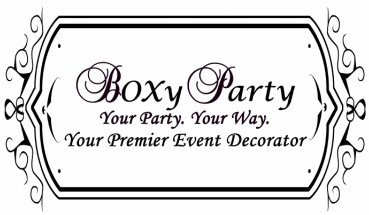 BOXy Party's goal is to provide you a cohesive, themed, and personalized decor for you next party. We, at BOXy Party, offer you an "out of the box" party decor. We offer a simple way to make your next party themed, personalized, and cohesive. Your Party. Your Way. What makes BOXy Party different? We take away the headache of driving around town, standing in long checkout lines, and endless hours of creating a beautifully designed do-it-yourself party. We understand that the time it takes to purchase supplies and put together a great-looking party is time away from your family. Local party store. You probably will not find everything you want for your theme and you end up wasting your precious time. Online party store. You still will not find everything you want on one website and it will not be personalized. BOXy Party. You choose what decor you want to buy, you personalize it, and you decide how you want to use it. The choice is simple, BOXy Party! To view sample party packages, click here!